Updated 1.29.2019 to include another great day on Korohusk. 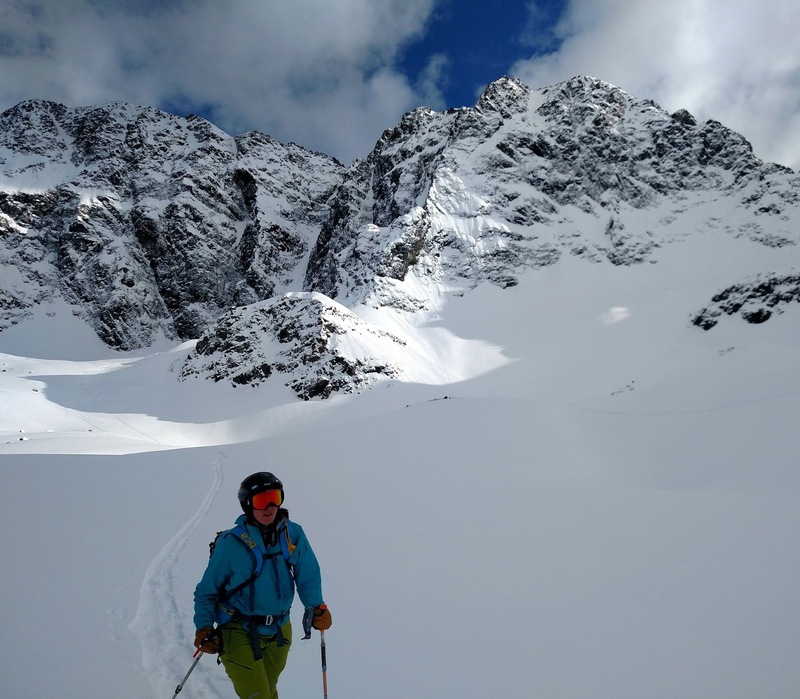 The first time we skied Korohusk, Carpathian had been the day before. Then, to start the day, we sent Tarah and Max's Subaru backwards and sideways down Mariah Drive and into a ditch. When Tarah got out she promptly ended up on the ice under her car. When I got out I ended up on my face in the ditch 100 meters below the car. I was hoping things would be equally exciting this time around. Fortunately, last week I managed to contract the plague, so things were looking up for an adventure! Apparently there was widespread collapsing as we skinned up the valley, but I did not notice such minor details thru the haze of sinus headaches and snot rockets. Arriving at the head of the valley the snow deepened and signs of instability decreased. 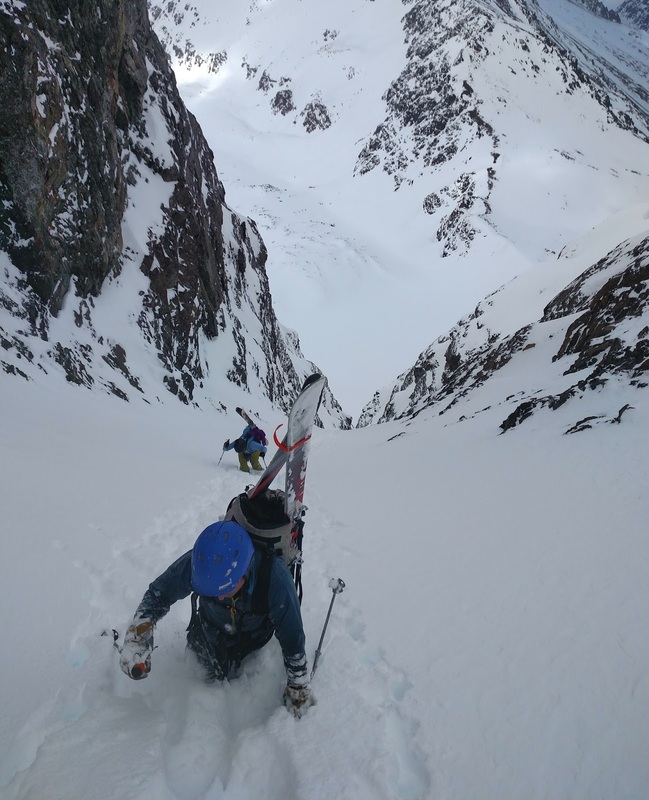 We started with the Korohusk's pinner couloir. Its an unusual one, the right wall is really just a large flake, which disappears at points. Maybe Alex is covering his face to avoid peering off the edge? I spent most of the climb raving about how much I loved my Verts and how I couldn't imagine anyone climbing anything without them. Tony does not have Verts, I bet he loved the constant reminder of how much harder his day was. Popping over the ridge at the top brought the sudden jaw dropping views of the Eagle River giants: Polar Bear, Organ, Flute, Ewe, and Eagle Peaks. The lower peaks on the left make up part of the Crow Pass to Glen Alps traverse. North was equally awesome. Rumble with Bold behind it. Those two have been on the Wish List for awhile and are still near the top of it. Bold Peak looking a little thin; maybe we'll get a big spring storm. Pleasant and Peeking. These Bad Jackson's hold iconic lines; there are several more lines I'm excited to ski, and the rest are worth going back for. Alex contemplating the head of Peters Creek and the Shroud. My negotiations to ski this are not making progress. Yet. In the distance we could see Marcus Baker wrapped in wispy clouds. Zack said it looked "alpine". This is the same person who thought skiing Bench Peak in a day in early February was a good idea. So, I'll take it. After lunch and a hit of Mucinex Extreme in the warm sun, we dropped back down towards the Ram Glacier. 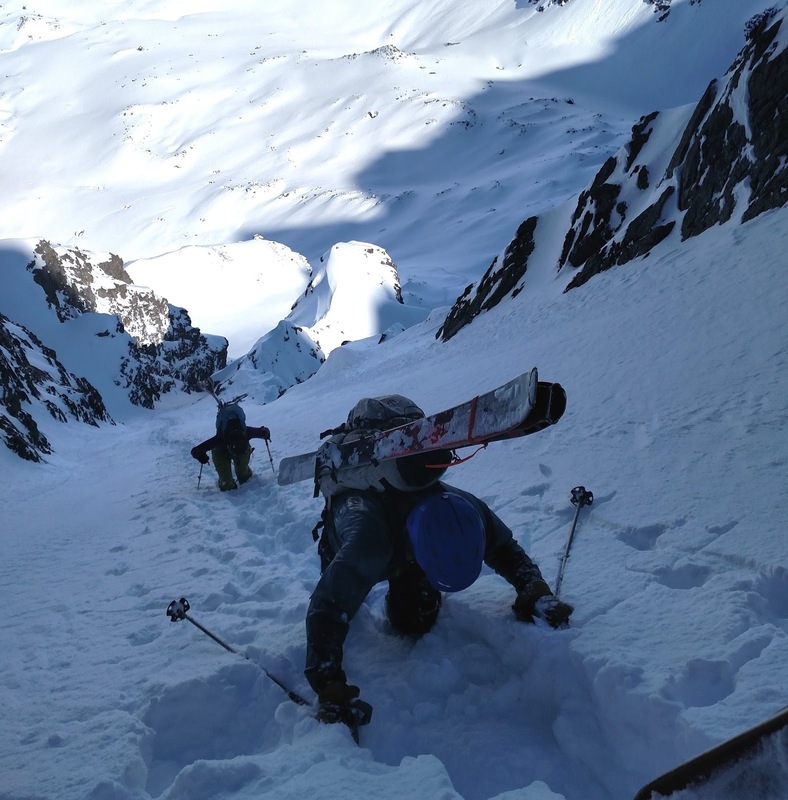 This picture gives a good idea of how the right wall of the couloir isn't much of a wall. Khalial came thru the choke next. The section above her was about 12 feet wide. On fat years it opens up to maybe 20 feet. Tony leapfrogged past us and out of sight around the corner. As the line opened up she came charging past. 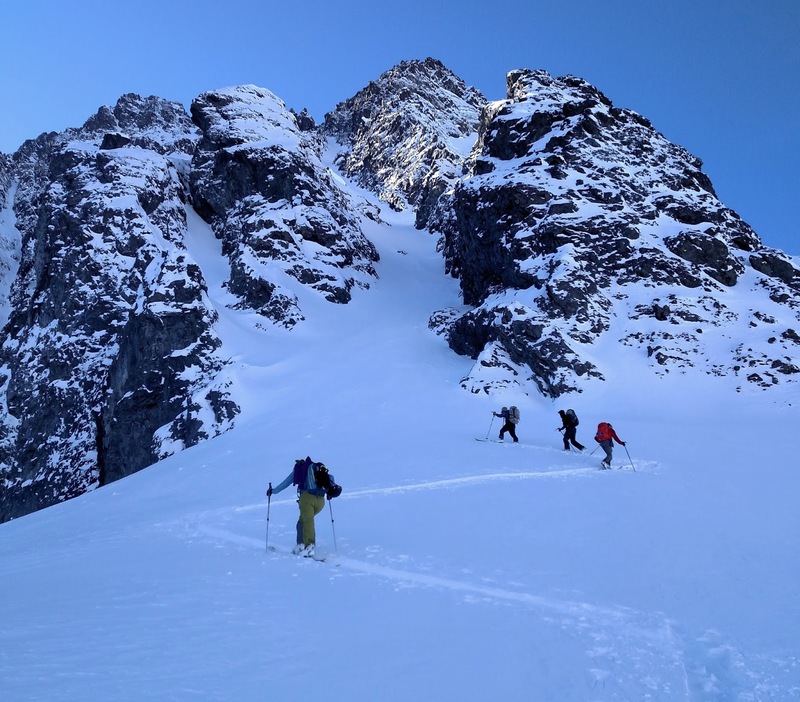 Then Tony took the lead and skied down to the glacier. At the bottom Tony surprised me by announcing that he thought I was going to "send that cliff". I had not noticed that cliff. But, sure enough, my tracks did tickle the edge. Next up was the dogleg coulior, which I had skied before and announced was shorter and less steep. At some point the sandbagged truth about its pitch and length became obvious. Rather than harass Tony about Verts, I spent most of the climb wondering if it was time yet to have another shot of Mucinex Extreme. At the top we clambered over the rock wall and into the sun. Shivering in the surprisingly cold spring light no one wanted to leave for the shady north face. Muttering something about everyone else getting first tracks, Zack dropped first. I think the lower part of the dogleg is actually the steepest part. Alex modeling pole plant technique. The Korohusk amphitheater is a special place - sheltered under the giant silent walls brings a supernatural feeling. Looking back up at Korohusk from the Ram Glacier. The lower half of the dogleg is visible, the pinner is tucked into the right wall. Back at the confluence between Ram and Falling Water valleys we discussed our plan to camp then ski Peking the next day. Reasonable people expressed concerns about afternoon wet slides on the southerly egress. Proselytizing about straightling and outrunning avalanches, a less reasonable person disagreed. The discussion was settled once and for all when a large wet slide came down next to us. So, we called it quits while still ahead. Another adventure that didn't go quite as planned - make that the best kind of adventure. In January 2019, Alex Geilich, Neil Liotta, Matt Peters and I returned to Korohusk. Savage winds from a powerful storm in the Gulf of Alaska had laid waste to the Kenai, Chugach, and Talkeetnas. The valley floor was scoured to brown ice and there were dunes of crowberries and pebbles everywhere. Once on top of the bulge of the rock glacier the snow started to get softer. As we entered the apronless pencil couloir the snow turned to pow. At the top, we shivered in the cold, windy, midwinter sun before dropping back into the protected line. Even in January we had plenty of light left once finished with the Korohusk coolies. The lines on Cumulus were trashed by the wind, but next time I'd love to get a bonus lap in there on the way out.